A few days ago, I worked on a project that was mostly about serving up basic store data (modeled after Etsy) to an API. We had a few dozen end-points, and all responses were in JSON. Most of the action happened inside of our controllers, and as you might imagine, our routes.rb file was bananas. One of the instructors made an exceptionally simple suggestion, I was embarrassed to not have seen it. It was about nesting our controllers a bit better. Look at all the references to merchant and merchants! Lets count: Twenty-Four uses of the word! Dang! 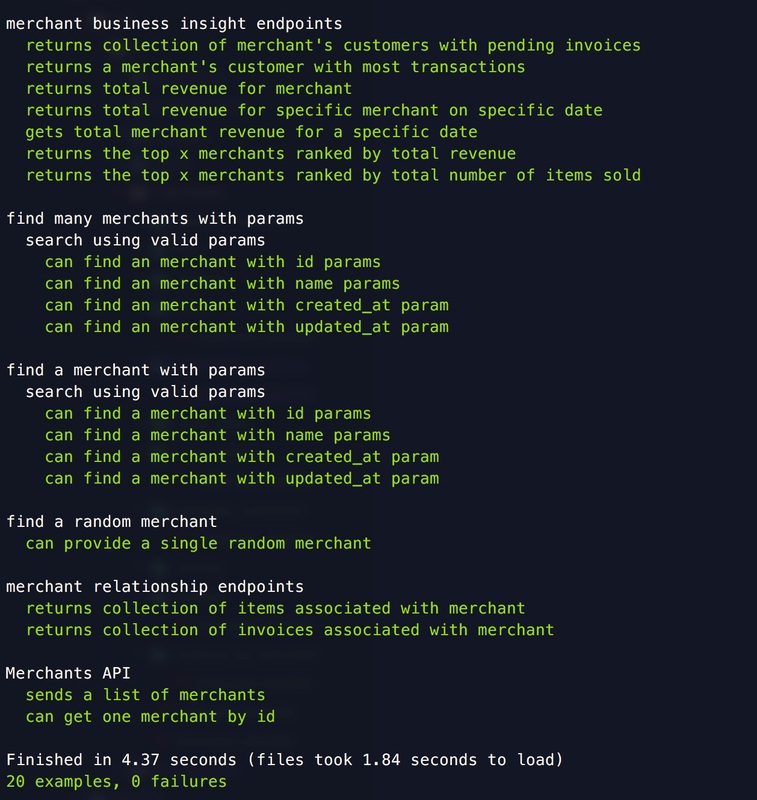 And this is in JUST the endpoints related to merchants! This same replication exists in our items, customers, invoices, and more. It’s also clunky to read. Every single merchants controller in the collection starts the same. That lowers the ratio of signal to noise, as a developer. No good. Hopefully someone moving through Turing behind us will take this chance for a really easy fix. That looks a lot better. Half the number of references to merchants in the routes. Now… this requires renaming all the controllers, etc, so lets make that happen and see if our tests still pass. The associated view, since the expected path is determined by the controller class name. So someone suggested a way to refactor even more. What’s that? A chance for even more refactoring? I immediately was able to get down to replying on Rails “convention over configuration”, which basically means Rails is going to look in specific places for specific things. Like in the /controllers/api/v1/merchants/ directory for most of my merchants controllers. Tests fail when I pull out those paths. Lets pick apart the pending_customers path. Interesting. It dropped the /merchants/ from the endpoint path. That is not what I expected, especially because it is still nested under merchants in my routes file. Hm. Well, on further investigation, looks like the PendingCustomersController didn’t even need to be nested inside of /merchants. It relies on a parameter passed into it (the merchant ID) but the routes that we told it to live at doesn’t require a merchant object in the path. Rejigger some of the folder names and locations, and everything still passes. This was a really good thing for me to learn about how Rails assumes controllers and views should be organized. It feels better to not override it’s default behavior, or to be verbose in describing where controllers should go. I didn’t pull out the last few references to merchants, because, well, I’m short on time. But this will be helpful going forward, next time I’m building out routes.